It's a Mom Thing Reviews & More! : Lalaloopsy Crazy Hair Dolls Giveaway Hosted by Growing Up Madison! Lalaloopsy Crazy Hair Dolls Giveaway Hosted by Growing Up Madison! My daughter is absolutely obsessed with Lalaloopsy! Ever since the first dolls came out she has been hooked. Now she loves searching the shelves for new products that she doesn't have and can add to her collection. One of the best things about Lalaloopsy is that they are constantly coming out with fun new products to keep all of their little fans happy. One of the newest types of Lalaloopsy products are the Crazy Hair Dolls! There are four Crazy Hair Dolls available: Cinder Slippers, Jewel Sparkles, Confetti Carnivale, and Scoops Waffle Cone. These dolls allow children to be creative and try out new hair styles on these adorable dolls. Children can cut their dolls hair, make it grow, pile it up high, curl it, and more, their options are endless! 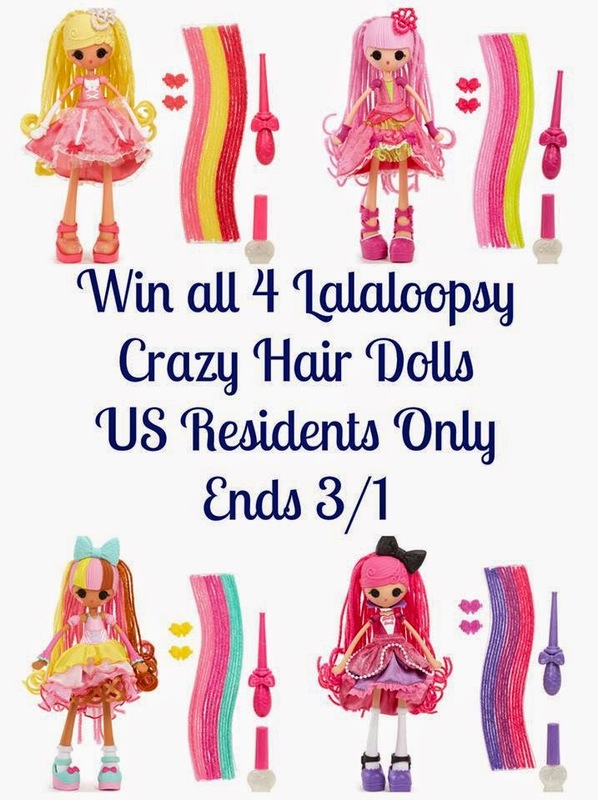 Now you have a chance to win all 4 Crazy Hair Dolls! Enter below! My daughter LOVES lala loopys, she loves getting the dolls big and little.